lightning but a few thunderstorms may become strong with gusty winds. could produce winds of 40 to 50 mph. become strong and produce gusty winds. from 105 to 107 degrees. Good Monday Morning folks!! well stormy and booming thunder here,some good rain also..in looking at the forecasts I see rain chances go down thru the rest of the week here..after today....well i got about .25 so far this morning..hope for more..have a wonderful day folks! heavy rainfall, and dangerous lightning. Good Monday morning. Had morning T storms Friday, Saturday and Sunday. Total for the 3 day period was 1.25". By the looks of the radar the bulk of the heavy rains this weekend were in Central and South FL. This AM a band of T storms has set up north of me running from Lake City southwestward through Dixie and Taylor counties and out into the Gulf. It has prompted a Flood Advisory from the NWS as it has already dumped 2-3" and is training in the area. That band and the associated energy is slowly sagging southward so I expect the rainfall to set in here sometime before noon. Normal weather in my area over the weekend. Had rain and thunder total in the bucket was .56 and at 2.42 for the month. Does look to be drying out this week but as always we shall see. well local met is saying rain chances tomorrow on thru the week are going down some with dry air moving somewhat into our area's..sounds good, some of our area's could use a lil drying out time huh. It's been a good rainy season here. Yearly rainfall is above average but nothing extreme. Periods of very wet weather then periods of dry weather for a week or so. A nice balance. I'm sitting at 3.46" for the month and 42.03" for the year. I was on the receiving end of the 2:30-3:00am thunderstorm. I dumped 1.18" out of the gauge and it was all from the early morning blob. I thought maybe I might pick up a little this afternoon, but nothing so far. I don't like the wet for a week and then dry for a week. I'd rather have a little rain every day myself. The AM rains with a west flow tend to give me better rain totals but I'd swap a little bit of the rain to have rain cooled air in the afternoon/evening. Yes I'd much prefer afternoon rain to morning for sure! Good Tuesday morning folks! well some clouds above but no rain so far by me,but WD might be getting some up there...well i have things to do today..so have a wonderful day everyone! And I wonder, still I wonder, who will stop the rain? Another .50" in the rain bucket as of the time I left for work this AM. Looks like it is going to stick around for awhile as the batch of storms isn't really moving. Most of the storm has been light to moderate rates, but occasionally it will pick up for a few minutes. Weather man says this pattern will last through tomorrow before shifting to the afternoon storm pattern later in the week into the weekend with some slightly drier air around. However, with all the rain on the ground over Florida there will be plenty of moisture for at least scattered storms everyday. The westerly/AM pattern looks to return again next week with another increase in moisture. Oh joy. Federal Point, or near Hastings, moving east at 20 mph. well in some area's around the state, some of the storms are getting strong along with it seems some bad winds etc...stay alert and safe folks ok..well so far nothing in my area, maybe later this evening? Hi, we only got half and inch out of that. Heard the thunder though. Good afternoon. Not much to report here other than new gutters have been put on the house. Full rescreen of my enclosure comes next then I'm done with all the insurance/contractor nonsense from the April hail storm. I'll then look for a good pressure washer as my house needs it, especially on the north-facing side where it's much more shaded and the mildew tends to accumulate much more easily due to reduced sunlight. Haven't seen JR pop on in awhile. Hope he's ok.
Good Wednesday Morning folks!! well no rain at my house yesterday and lower rain chances starting today as things change hopefully more back to our normal weather huh..have a wonderful day everyone!! Good morning. It started raining as I pulled out of the driveway this am, but it looks to be just a small popcorn shower that will drop a quick tenth or so. Yesterday was a strange weather day here for mid August. It rained off an on all day, but the rain was never that hard and only totaled 0.25". The sun really never came out, just a grey, dreary day. Today is starting off grey as well, but hopefully the sun will come out and maybe dry some things out. waterdipper wrote: Good morning. It started raining as I pulled out of the driveway this am, but it looks to be just a small popcorn shower that will drop a quick tenth or so. Yesterday was a strange weather day here for mid August. It rained off an on all day, but the rain was never that hard and only totaled 0.25". The sun really never came out, just a grey, dreary day. Today is starting off grey as well, but hopefully the sun will come out and maybe dry some things out. hiya WD,no rain here,suns out and only a 30% chance of rain,good luck up there and that light rain is good for the grass-plants etc..it soaks in not runoff. 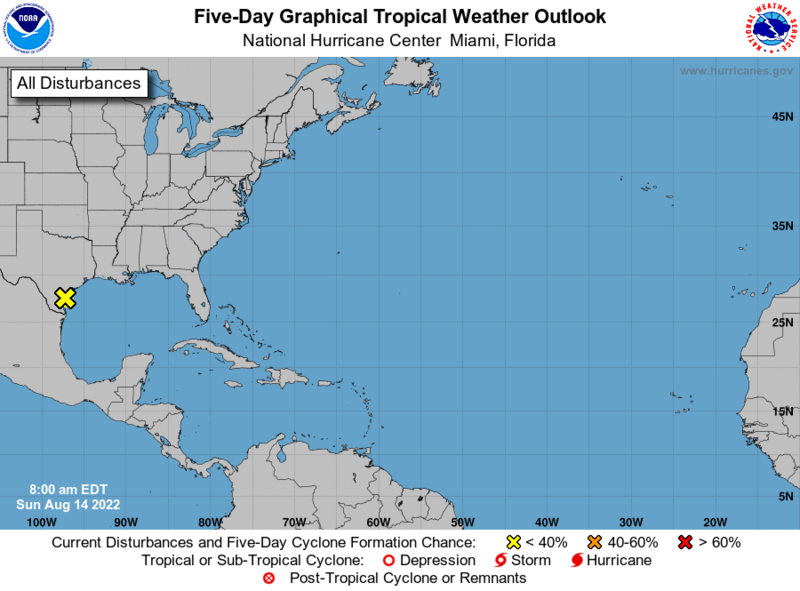 well so far we in Florida have been Lucky with NO tropical storms affecting us here..would be great if this trend continues huh. Winds in excess of 45 mph will be possible with this storm. Geiger Key and Shark Key. This includes US 1 between mile markers 3 and 14. 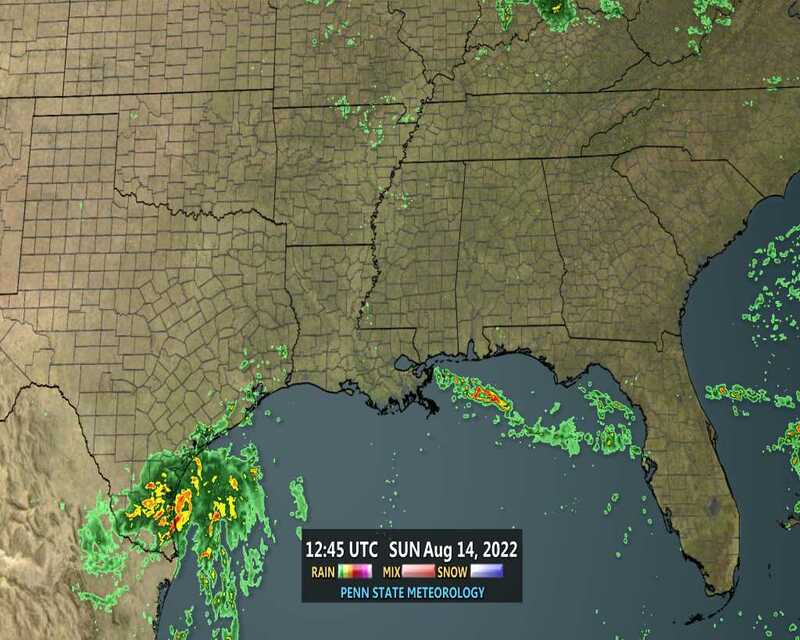 LargoFL wrote: well so far we in Florida have been Lucky with NO tropical storms affecting us here..would be great if this trend continues huh. Amen to that. I don't mind a mid-grade tropical storm but would gladly do without another Matthew or Irma anytime soon. Peak season is approaching so hopefully the next 2 months will stay quiet. Yes Largo you are correct! Spiders (and ants) have been super bad this year. But, watching TWC right now and the flooding up North is disturbing and it keeps coming . times of low tide today along the Atlantic beaches of South Florida. over western interior sections of South Florida, through Wednesday. National Weather Service forecast office in Miami. Good Thursday Morning folks!..another nice HOT day ahead with possible afternoon showers..wow i got a booming thunderstorm around dinner time last night..got a few light showers but the thunder and lightning was the big story with it..i wonder if it sank down to St pete also?...well have a great day everyone!...........oh by the way...in the Tropic's there finally is a wave coming across..only 10% chance of developing..just something to watch. Looks like the pattern finally shifted here in the Nature Coast sometime during the day yesterday. The morning storms that hit yesterday moved north during the day and the wind has come around to the SSE instead of the SW flow we have had for some time now. This morning it is clear and there are no storms on the horizon in any direction. Still a pretty good chance of afternoon storms and with the amount of water and moisture in the soils here locally, I expect a good chance of daily rainfall along the seabreeze boundary. The normal SE flow pattern looks to be short lived (again) and by early next week it appears we will be right back to the SW flow with scattered to numerous showers coming in from the Gulf overnight and into the morning hours. Several years ago we had a summer very much like this summer, with a predominant SW flow pattern and very wet. That summer the NWS dubbed it the "Summer of the Trough", due to the persistent trough over the eastern US. I am officially naming this summer the "Summer of the Trough II". waterdipper wrote: Looks like the pattern finally shifted here in the Nature Coast sometime during the day yesterday. The morning storms that hit yesterday moved north during the day and the wind has come around to the SSE instead of the SW flow we have had for some time now. This morning it is clear and there are no storms on the horizon in any direction. Still a pretty good chance of afternoon storms and with the amount of water and moisture in the soils here locally, I expect a good chance of daily rainfall along the seabreeze boundary. The normal SE flow pattern looks to be short lived (again) and by early next week it appears we will be right back to the SW flow with scattered to numerous showers coming in from the Gulf overnight and into the morning hours. Several years ago we had a summer very much like this summer, with a predominant SW flow pattern and very wet. That summer the NWS dubbed it the "Summer of the Trough", due to the persistent trough over the eastern US. I am officially naming this summer the "Summer of the Trough II". gppd morning WD..yeah we shifted back to our normal chances of afternoon rain and/orTS's...sounds good to me, can do the lawn etc during the morning hours. Antilles during the next few days. 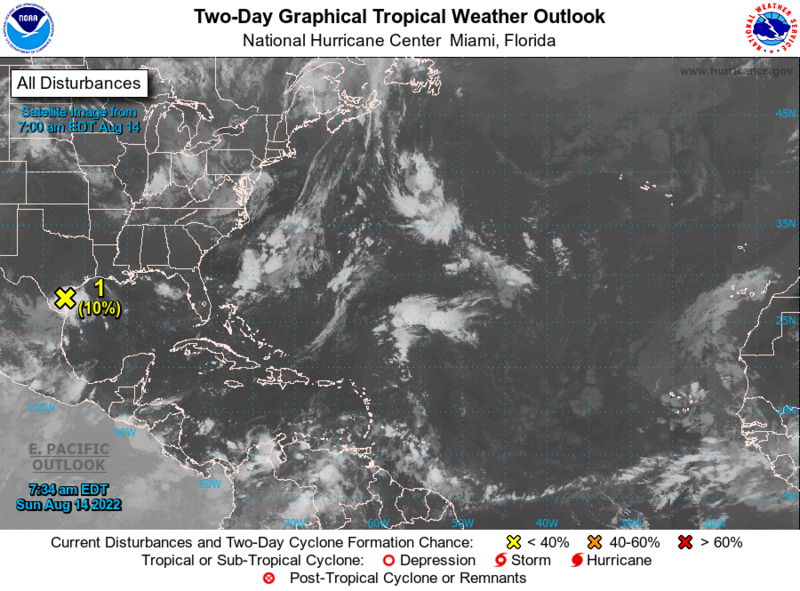 Billsfan keep a good eye on that 99L coming next few days..hopefully it doesnt get strong and just a rain maker. Atlantic beaches of South Florida. main hazards with these storms will be lightning. over western interior sections of South Florida, through next Wednesday. yes AUG, havent seen nor heard from JR also in awhile..hope he is ok too. well sure is HUMID here by my area, just finished mowing the lawn and trimming bushes etc,,whew had to take a shower i was soaked..but maybe some rain later this afternoon to cool things down a bit..i hope. Yep WD, it must be the trough . Look at the same areas in the NE getting hammered over and over again with rains / flooding. Hot, hot and dry here . Yeah Largo, will watch and see about 99. Good afternoon. I wish I was back on vacation. The salt mine is already wearing me out. I do have a 3 day weekend but will be busy with travels driving my mom down to Sanford Sunday afternoon while we stay at a hotel then seeing her off at the airport the wee hours of Monday morning. Also had my car battery crap out on me (fortunately at my house and before my trip!) Got that fixed yesterday afternoon after I got a jump from a neighbor then stood outside at the AutoZone in a downpour. Had a very small cell (barely noticeable on radar and maybe 2 miles in diameter) park over me for 10 minutes early. No thunder/lightning. One could see clear skies in a few directions but that little sucker dumped some rain. .37"
StAugustineFL wrote: Good afternoon. I wish I was back on vacation. The salt mine is already wearing me out. I do have a 3 day weekend but will be busy with travels driving my mom down to Sanford Sunday afternoon while we stay at a hotel then seeing her off at the airport the wee hours of Monday morning. Also had my car battery crap out on me (fortunately at my house and before my trip!) Got that fixed yesterday afternoon after I got a jump from a neighbor then stood outside at the AutoZone in a downpour. whew Aug, you had quite an active week,remember to take some time for yourself and relax a bit too ok.